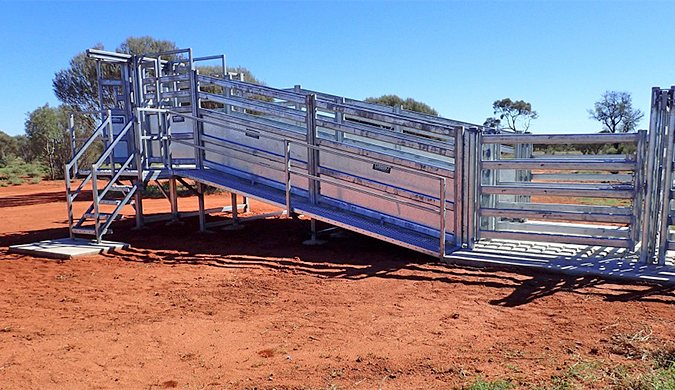 A recently installed cattle loading ramp at the Mulga Yards at Old Man Plains Research Station will improve animal welfare and staff safety. Old Man Plains Research Station is a 522 square kilometres rangeland on the Owen Springs pastoral lease south of Alice Springs. It provides land, cattle and facilities for research and extension programs to support the development of the Central Australian pastoral industry. The Mulga Yards are the hub for that activity. Support for the Central Australian pastoral industry includes the Indigenous Pastoral Program—work that’s important to pastoralists in arid regions and abroad. Most recently, projects undertaken at OMP include grazing system demonstrations, an adapted breed of cattle, and new pastoral technologies. The steers that are currently loading on the new ramp will be assessed for meat quality in a Meat Standards Australia pre-trucking trial.